what kind of cutting system you use (for a big slab mold you will need a log splitter, while if you choose a single cavity mold you won’t have to cut your soap at all. Before you buy a soap mold you should also ask yourself if you mind handling wing nuts, screws and bolts. A lot of molds (except silicone) are held together that way, which is good on the one hand since the pieces are not glued together (most glue is not heat resistant and your mold might fall apart, if you place it in the oven). On the other hand you will have to make sure that you don’t lose all the itty bitty pieces, and the putting together and taking apart of the mold can be a little bit of a hassle. If you’re not into nuts and bolts, there are high quality molds out there without them. It’s just something to watch out for. When it comes to finding the right kind of mold in terms of material there are certain things to consider as well. Here’s a breakdown of 4 different materials soap molds can be made of. There are certain advantages and drawbacks to each one of them. It really is a matter of determining what’s important to you. Molds made of wood are probably the most traditional kind of molds. Typically they come in loaf mold or slab mold (low rim, broad pouring surface) size. Handling a well-made wood mold really is a delight. The sheer weight of it and the smoothness and smell of the material is pretty unique. If you’re looking to gell your soap without much fuss than wood is the way to go. Wood molds insulate soap like no other material and most (especially slab molds) come with a cover to hold the heat even better. You could wrap a towel around your mold just to be safe (or if the temperature of the room is low), but I find the wood itself keeps my soap warm enough to achieve complete gell. Wood molds come at a higher price than let’s say silicone molds, since you pay for the craftsmanship as well as for the material. I’ve seen wooden soap molds that look like they’re made out of plywood that has been cheaply glued together – stay away from them. Go for quality – you will have this mold for a very long time. The big drawback with wood molds is that they need to be lined with freezer paper or you need to buy a silicone liner for them. My experience with liners hasn’t been great so far. The ones I have are so flimsy that they tend to flop inward so that the soap comes out deformed in the end. I’ve tried tape and clips but I couldn’t get them to stay all the way straight. 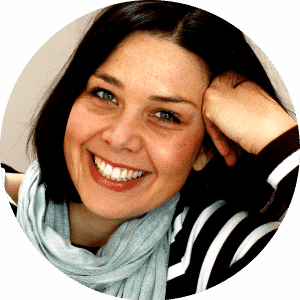 I gather there are now new and improved liners out there – I haven’t tried them yet – and I hear great things about the Nurture Soap liners. 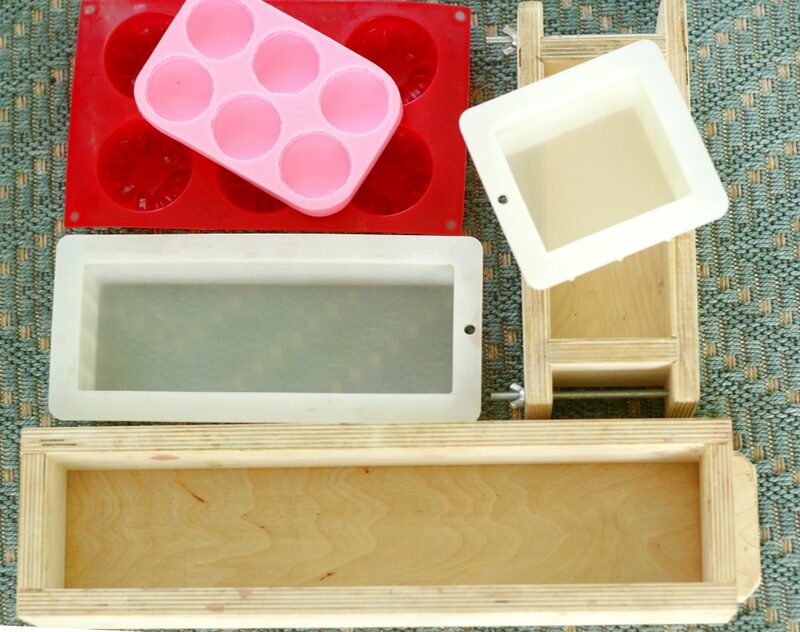 If you want to make melt & pour soap in a wood mold, I would definitely use a silicone liner. Melt & pour soap is too thin when hot and will seep through the seems of the freezer paper. Wood also has the disadvantage of being a little harder to clean. If you happen to get raw soap batter on your mold, you would have to scrape it off and it will most likely leave a mark. Silicone loaf molds are what I primarily use these days. I like that they come in smaller sizes 1 – 3 lbs. which gives me the opportunity to experiment without wasting a lot of raw material. I also like the fact that they don’t need to be lined, and are light weight and pretty affordable. The finish of the soap when unmolded is nice and smooth as well. However, silicone molds have their drawbacks too. They’re less sturdy and especially if you’re looking at a tall & skinny mold (a mold that’s much taller than it is wide) the sides tend to bow outward once the soap is poured. 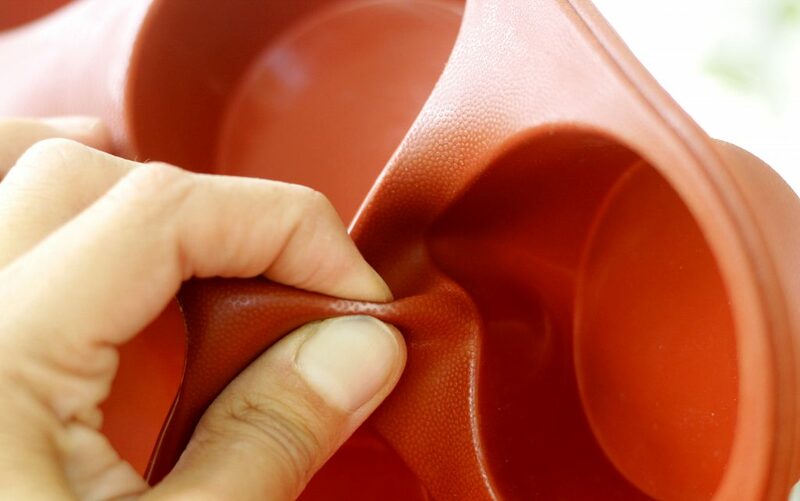 That’s why some silicone loaf molds come with a metal basket that keeps the mold from losing its shape. Some folks have problems releasing their soap from this kind of mold. Most manufacturers recommend the use of sodium lactate or salt to help harden the soap for easier release. Using a high water discount, putting the soap in the freezer before unmolding, or simply waiting a few more days before getting the soap out work as well. 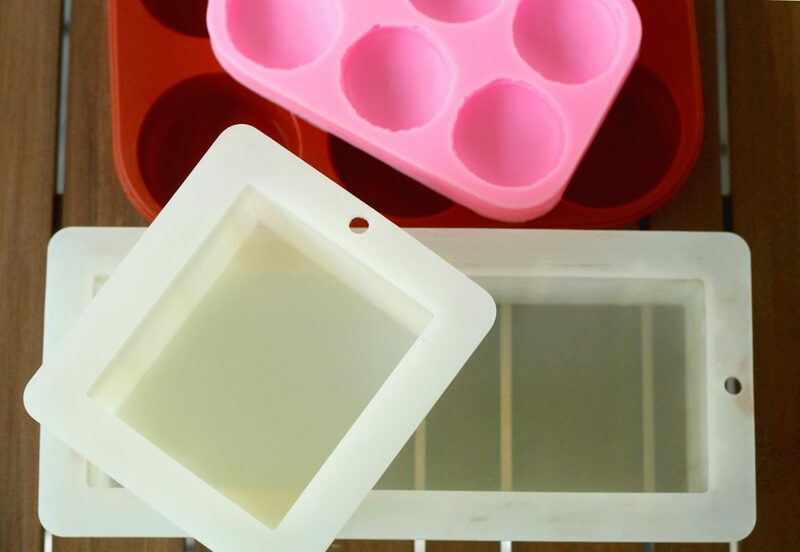 Silicone molds create an airlock around the soap, so make sure to always pull on all of the sides first to release them from the soap and then gently press on the bottom. If the soap doesn’t budge don’t force it, it’s better to wait another day and try again. 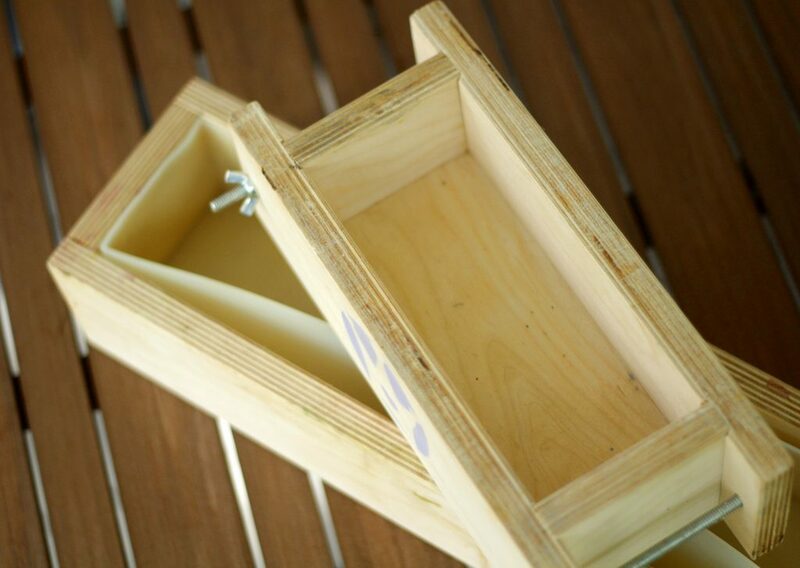 Silicone molds will also give you much less insulation than a wood mold. Sometimes you can get away with wrapping a towel around the mold to force gell, but I found that the best bet really is either putting the soap in the oven on low heat or placing it on a heating pad. These are so much fun! They come in all shapes and sizes and usually aren’t expensive. They’re a great way to change things up or to make themed soaps for a special occasion (baby shower, wedding favor, bridal shower, etc.). They can also come in handy if you’re looking to make embeds that will be later placed in or on top of a soap. The good thing is that you won’t have to worry about cutting them into bars. Simply pull on the sides of the mold a little and plop them out. They will come out with a nice smooth finish. If you wish to gell your soap, you will have to use your oven to achieve full gell. You can buy single cavity silicone molds in lots of places online or even in the bakery aisle at your super market. Be aware though that not all silicone molds are created equal, some have cheap fillers in them that impact the durability of the mold. To find out if a mold has fillers you can do the “pinch test”. Fold the mold in half and squeeze it between your fingers, if the fold turns white you’ve got a bad apple, if it keeps its color you’re good. Now, how does it work? In short: you have a hard object that you want to turn into a mold, you use a moldable silicone putty that you press like play-doh around the object, you wait for it to harden, you take the object out and – voila – you’ve got yourself a super unique soap mold. Ariane wrote a great tutorial on it over at Modern Soapmaking. Now, the down side of course is that you have to buy the material and take the time to make the mold. Since I haven’t tried it myself I’m also not sure how heat resistant the mold is. I know it works great for melt and pour soap, but I’m not sure about gelling cold process soap in it. Now, what is HDPE? It’s a high quality plastic (high density polyethylene) that is also used to make cutting boards for commercial kitchens. Maybe you’ve seen these molds before – the material is white and the walls are quite thick. These molds are super sturdy, durable, heat resistant, and insulate pretty well (not as good as wood though) and best of all they don’t need to be lined and are easy to clean. They’re definitely more on the pricey side, but manufacturers claim they will last a lifetime. The great thing about these molds is that they are see-through. I picture this being useful when you’re doing a layer design or you want to place an embed at just the right place. I would stay away from acrylic, especially if you’re a cold process soapmaker that likes to gell your soap. Acrylic doesn’t do well with high temps or big swings in temperature and overtime your mold will crack and break. There are transparent molds out there made out of very sturdy resin or plastic – these can be used for cold process and melt & pour soap. If you have any questions about the performance of a specific mold ask the manufacturer or company directly. They should be able to answer your questions. Tell me: What is your favorite soap mold?